A little over a month ago, I signed up for something Foodie PenPals. Lindsay over at The Lean Green Bean and Allie over at Healthy Balance, Healthy Life came up with the idea for people who blog and people who read blogs to be part of a penpal style exchange of foodie items! It has introduced me to many new blogs that I love. – Send a package of foodie items by the 15th of the month to your penpal. There is a $15 limit, and it must include something written. – Post a blog of what you got the last day of the month. I sent a package over to Sarah at On Tap for Today! 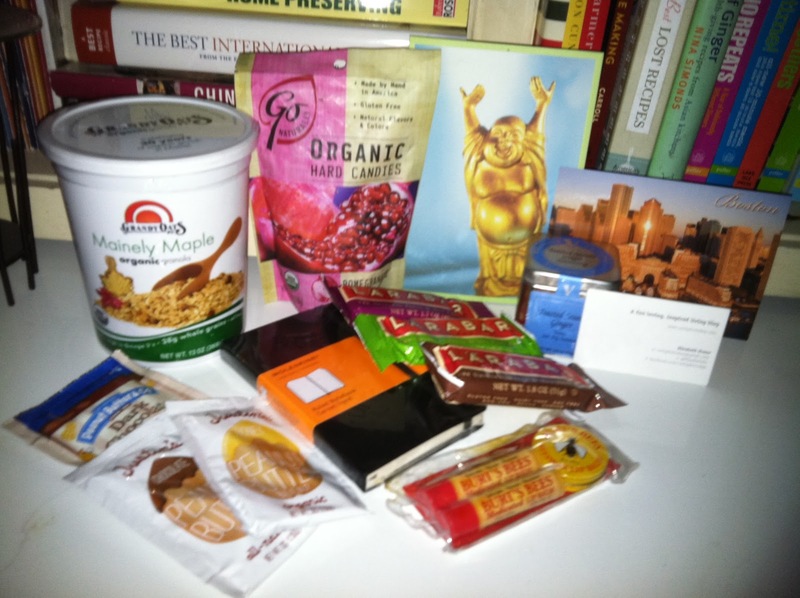 Maple Granola, Pomegranite Hard Candies, Ginger Sesame Seasoning, Three Samples of Peanut Butter, Three Larabars, a moleskin notebook, Burts Bees Chapstick, a postcard of Boston, and my favorite, a Buddha Card saying YES on the inside. I cant wait to dig in. sounds like some great stuff!! Awesome girly! Can't wait to see the photo when you get it!! Hi Hannah! Glad the package reached you— hope you enjoy your goodies! I did! Thanks Elizabeth. Jeremy is super excited to cook with the sesame ginger spices, and we both LOVE the candies. The granola I am being stingy with and not letting Jeremy have *EVIL LAUGH*! I spy a moleskin notebook- my favorite!